Exterior aesthetics of any building are one of the most important things for approaching customers or clientele, and nothing catches the eye quicker than dirty windows. They can cover such a large area and can set the tone for the interior if they are not sparkling clean. Much can be said the same for any interior glass that you have. 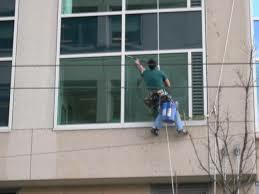 CLICK HERE for our Commercial WINDOW CLEANING care. Dust can settle on the glass and as soon as this is knocked, the mark is visible to the naked eye clearer than anything. SBS have professional window cleaners who have perfected their experience and knowledge, this can leave your windows streak-free and sparkling. For internal windows and glass, they have access to the best techniques that can gather any dust and help prevent the dust settling back once they have finished cleaning. Windows companies Edmonton has to offer presents you with a huge number to choose from, but do they all possess access to the best equipment for hard to reach windows or chemicals that will not harm your windows, window frames or the environments? Many will give a quote and the most of what they use can be a few squirts of dishwashing liquids, this can not only be environmentally unfriendly it is also unethical to base a quote on cleaning with this form of mentality. Our certified window cleaning experts have perfected their own techniques and can clean the stubbornest foreign matter from glass without any form of damage. We also offer a cleaning schedule which causes minimal disruption and is both affordable and does not compromise on our Guaranteed promise. To find more on the best janitorial services, or any other floor care service you may find a need in Edmonton AB, please contact our cleaning specialists NOW, who can be contacted 24/7, and 365 days per year on 780 – 939 – 2799 in Edmonton AB and receive your FREE quote.